3 plants cultivated by members of ORCHIDS.ORG. 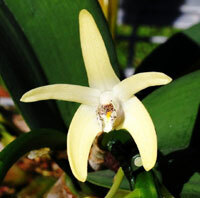 Dendrobium speciosum is an orchid species identified by Sm. in 1804. ORIGIN: In Queensland Australia and is a species from the D. speciosum alliance, it can be found in the coastal plains and in the highlands at elevations of 20 to 1200 meters. DESCRIPTION: A large sized, cool to warm growing terrestrial or lithophyte with stems enveloped by sheaths carrying 4 large, leathery, purplish leaves that blooms on an axillary, semi-erect to pendant, racemose, many flowered inflorescence that arise from the nodes at the apex of the cane occurring in the late winter and spring. They experience a wet season from summer through autumn and then it is considerably drier from winter till spring and they can take some direct sunlight. FLOWER SIZE: 1.2 inches [3 cm] -- information provided by Jay Pfahl, author of the Internet Orchid Species Encyclopedia (IOSPE). We cannot grow these very well is South Florida so sometimes when orchid judges see a baby at a local show they are very impressed - until they do the research! Guess it's too hot there. You probably have some problems with the Cymbidiums too. Easy outside grower here in Southern Calif. I have many blooming size and some seedlings. They are the hardiest plants I own. Reliable bloomer. Protect from frost is only caution which rarely occurs here. Grow in large bark(~1inch) with charcol. 20-20 every 2-3 weeks. Maybe some high bloom late Winter -early Spring. These plants can get huge. I noted several of my D. speciosum have what looks like flower spike buds. I just sprayed a few weeks ago with high bloom fertilizer.